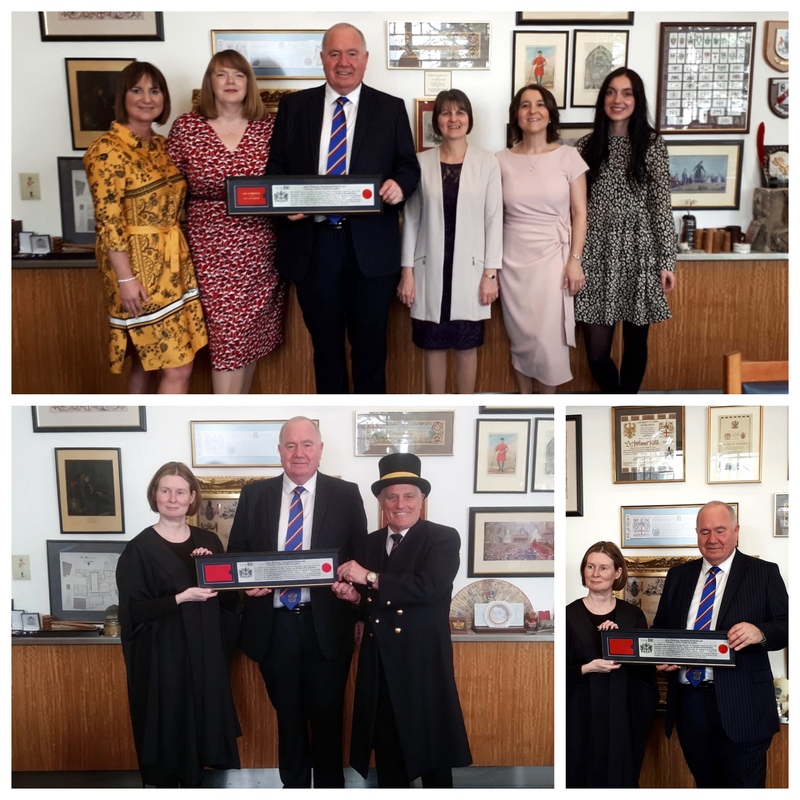 Our Director, Tony Grimshaw OBE recently accepted the Freedom of the City of London. Tony was extremely proud as a Lancastrian to attend the ceremony of declaration at Guildhall, London. He was escorted by the Beadle (wearing a top hat and frock coat) and the ceremony was performed by the Deputy Clerk on behalf of the Chamberlain. It is one of the oldest surviving traditional ceremonies still in existence today and is believed to have been first presented in 1237. Tony was joined be his wife Helen, three daughters; Susan, Alison and Sarah, and London based granddaughter Beth. Friends, families, and fans flocked to the Wham Stadium on Saturday 23 February for the Accrington Stanley Football Club’s Family Fun Day in the Studio-sponsored Eric Whalley Stand. The Reds’ family day, the first of several planned events throughout 2019, was a great success following the introduction of a special family ticket offer in the Studio-sponsored Eric Whalley Stand. Two children were able to attend Saturday’s fixture against Southend United for free when accompanying a full-paying adult. Local businesses rallied together to provide a budget friendly day of family fun with every child who attended receiving free hotdogs from the football club and free milk from the Modern Milkman, as well as a reusable bottle provided by Studio Retail Ltd and a Property Shop banger stick to cheer on the Reds. Keen to encourage sustainable and environmentally friendly initiatives where possible, local company and sponsors of the Accrington Stanley ground Wham® – the UK’s largest plastic manufacturer – donated three 92litre Upcycled boxes for the free milk cups to be collected in, for them to then be taken to be recycled. “You wouldn’t have known it was a Saturday in February, the sun was definitely on our side! Many of the children who attended the event were wearing their free Stanley shirt they received as part of our initiative last year, a lot were attending for the first time. This was wonderful to see and exactly what we were hoping, to engage with the local people who make Accrington great. The Housewares Innovation Awards are a well-establised scheme designed for businesses in the housewares sector – What More UK are celebrating coming home with two prestigious awards. On Monday the 4th February, not only was the exceptional service of the company recognised, Tony Grimshaw was also crowned Kitchen Hero in the Awards ceremony. Categories at the awards reflect the vibrant nature of the industry. The Housewares Innovation Awards give outstanding retailers and exceptional individuals a platform to shine, with the best in the industry in attendance on the night. The Kitchen Hero, sponsored by Home Hardware, was the last award to be announced. We celebrated a busy month with two renowned trade shows under our belt. The Spring Fair at the NEC took place 3rd – 6th February, we then travelled to the Ambiente Trade Show in Frankfurt for 8 – 12th February. Boasting credentials such as being the UK’s largest plastic manufacturing company and being proud owners of multiple national awards including The Queen’s Award for Enterprise – International Trade, it has set us in good stead to showcase our fantastic products both nationally and internationally. “Both the Spring Fair at the NEC and Ambiente Trade Show in Frankfurt have been a huge success for What More UK. 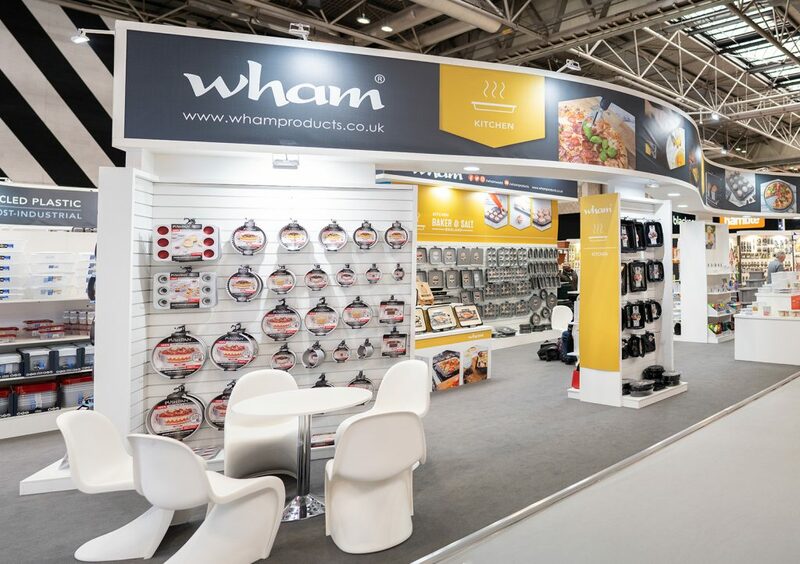 The trade shows we attend are a huge part of networking, launching our new products and sharing the Wham® name. Its really important to communicate with buyers and showcase what we have to offer. Our product range is continuously expanding to match the supply for demand. 2018 was our busiest year to date with record-breaking sales that we are really proud of. 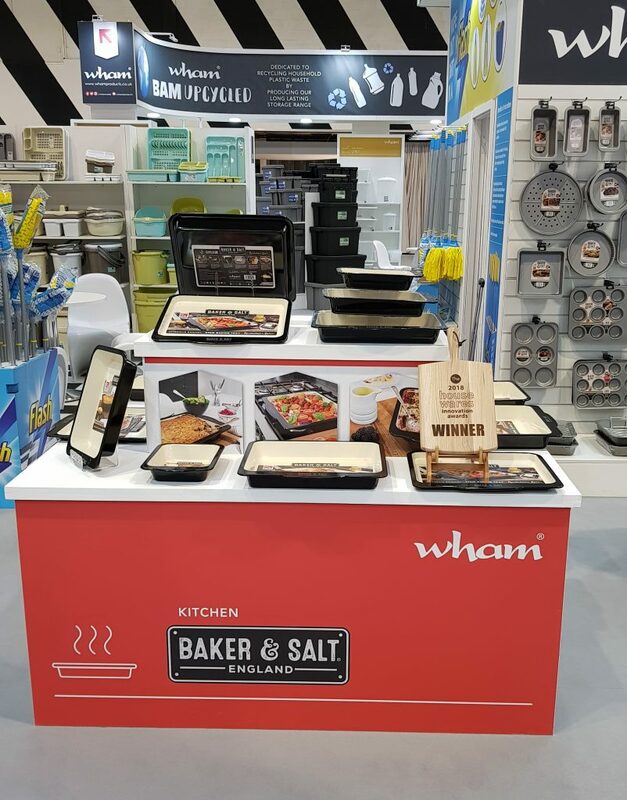 This won’t be the first time Wham® have attended the two trade shows, receiving outstanding reactions to their stands hosted in previous years. Last year saw the introduction of the FLASH range which is already rapidly expanding for 2019 – going from two products to seven. Some of the new items, such as the dustpan, brushes and brooms are now in many stores (independent and chain), in the UK and Ireland. “It’s very special as an independent company to have our products flying off supermarket shelves. We put a lot of time and skill into producing quality products as well as raising awareness for British products and environmentally friendly processes. With the pending Brexit and the concern about global warming, awareness of both is hugely important to us. New year’s resolutions can fill us full of dread and force us to retreat to a dark corner safe from the “new year, new me” diet or the I’m going to give up my chocolate fad (how could anyone give up chocolate!). Instead, make goals that are small and therefore achievable, fulfilling and a lot easier to maintain. January is a great time to give your house a full blitz. Housework can often get pushed out of mind over the holidays but with Christmas causing chaos and clutter it can be the best time to re-evaluate how you organise your home. Finding ways to efficiently store new things gives the opportunity to clear out anything you no longer use/want. We’ve got all the storage options you’ll need to store away those piles of toys, gifts, decorations and even your big Christmas tree. 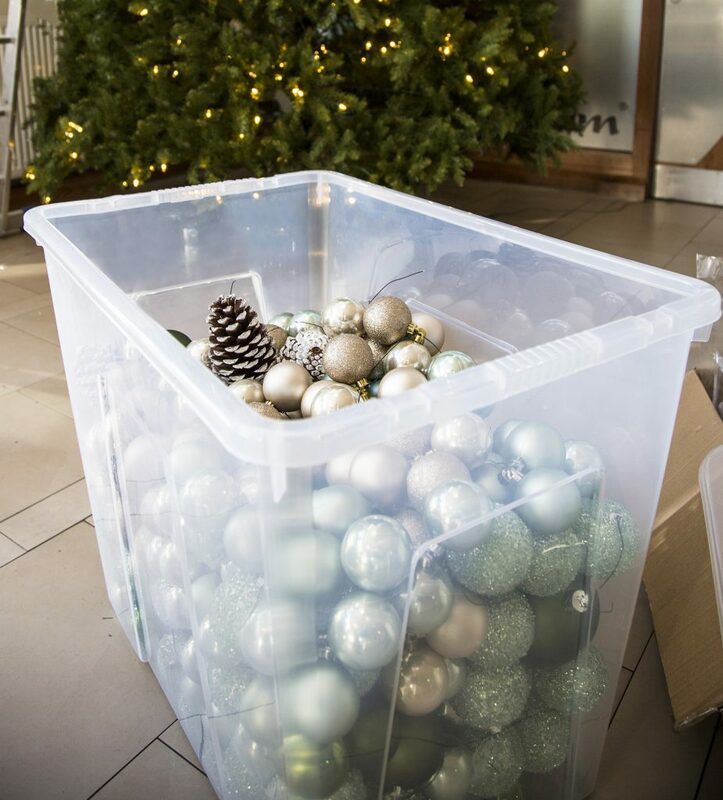 Wham Crystal is perfect for storing decorations, unused wrapping paper and your Christmas tree. These transparent boxes will come in handy next year when you need to see what is in each box. Wham Bam is great for heavier or bulkier storage for the garage or loft, it’s strong and durable, which will keep everything inside safe. Wham Organisers are perfect for storing smaller items that can then fit into cupboards or drawerswithout getting muddled up. We even have one designed to store Christmas baubles. Studio baskets are a great choice for storage that’ll be on display, they have a modern and sleek design – practical and stylish. Once everything has been organised and the chaos of Christmas has been cleared, get yourself some new cleaning products that make doing the big clean much easier – browse our cleaning ranges including our range of Flash mops. We have no doubt that you’ll feel a sense of accomplishment once you’ve finished. A clearer, tidier home always makes your mind feel decluttered, ready to tackle the new year. Instead of the dreaded ‘lose weight’ resolution, which can be a daunting and depressing task, try to be more specific to make it more achievable and manageable. For example, ‘do a 30 minute work out twice a week’, or find a way to make it more enjoyable by finding a sport/activity that appeals to you that will encourage weight loss and increase fitness – a yoga class, frequent walks or dancing. Activities that are good for the body are also good for the mind, improving your general wellbeing. Another satisfying alternative to the ‘lose weight’ resolution is meal prepping. Meal prep can be a fun way to experiment with food, control what you are eating and introduce more nutrition into your diet, plus, if done correctly, could lead to achieving a weight loss goal. To get started all you need to do is invest in some quality food storage, research recipes that are tasty as well as easy to prep and dedicate time in your routine to prep your meals for the week. 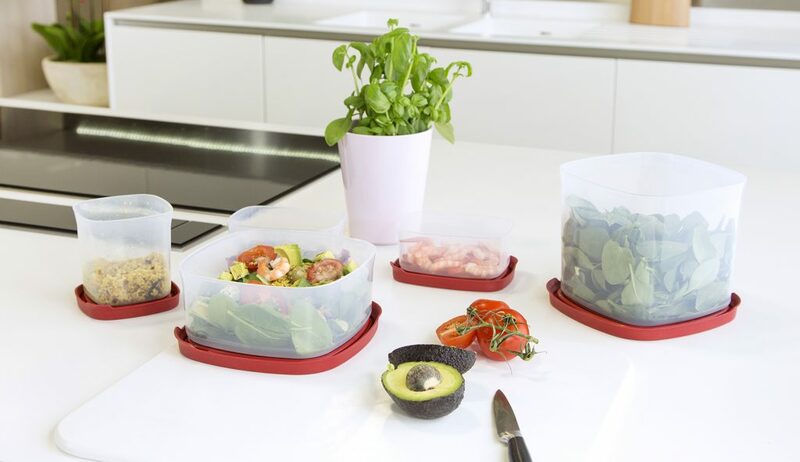 We offer a range of food storage boxes – Food Locker, Seal It and Cuisine, all of which are safe to use in the refrigerator, freezer, dishwasher and microwave, making them perfect for your lunches at work or at home. Also, they’re clear so you can easily see the contents of each container when stored in the fridge. You can find a variety of sizes and shapes to suit any meal. For more ideas look out for our series of Meal Prep blogs coming VERY soon. ‘Drink more water’ is a common resolution with tonnes of health benefits including better skin, clearer minds and weight loss. For those who love fruit drinks this goal can be problematic, however there is a way of making it more interesting. Finding a new water bottle in your favourite colour or with a quirky function can make your daily hydration more fun (see our full range here). 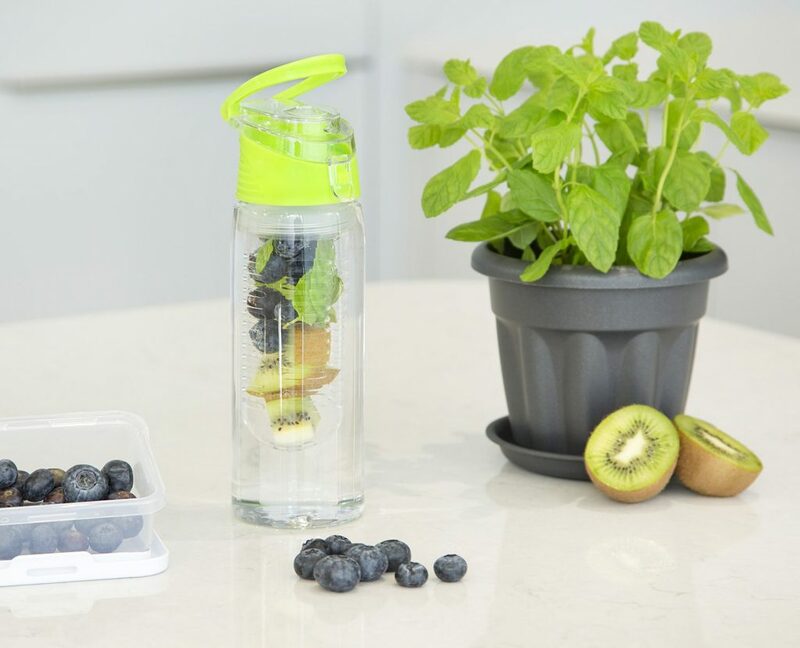 For something different our Wham® Infuser bottles make water more enjoyable by infusing it with your favourite fruit. Choose and cut up colourful fruits that will lift your day, place it in the infuser stick and let it infuse away whilst you start your day. It will create flavoured water with all the added goodness without the calories. Mix up the flavours day to day to help keep it varied and interesting. Take your drinks bottle for a picnic, day at the beach, walk, gym or office. Click here to get inspiration for exciting flavours and happy hydrating. As an extra boost choosing a re-usable water bottle will help the environment. We’ve all seen the damage single-use plastic bottles are doing to our oceans. Using reusable bottles can replace hundreds of bottles you would use yearly, so whilst you’re helping your wellbeing you can feel happy in the thought you are helping the environment too. Gardening “exposes you to vitamin D and healthy microbes in the soil” and is said to boost your mood (schooledbyscience.com). 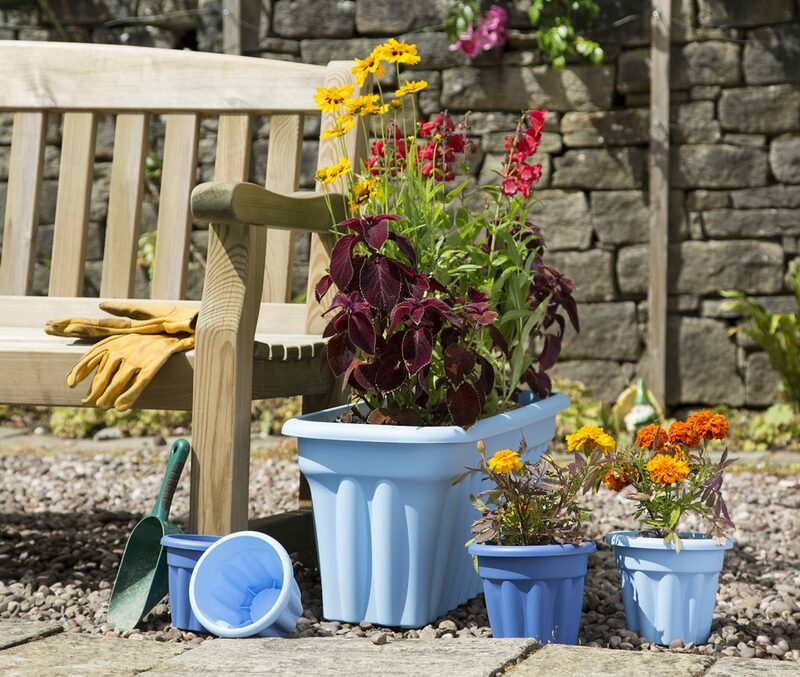 If you fancy giving it a go, browse our extensive ranges of garden planters and accessories, available in many shapes and sizes to suit your garden space. 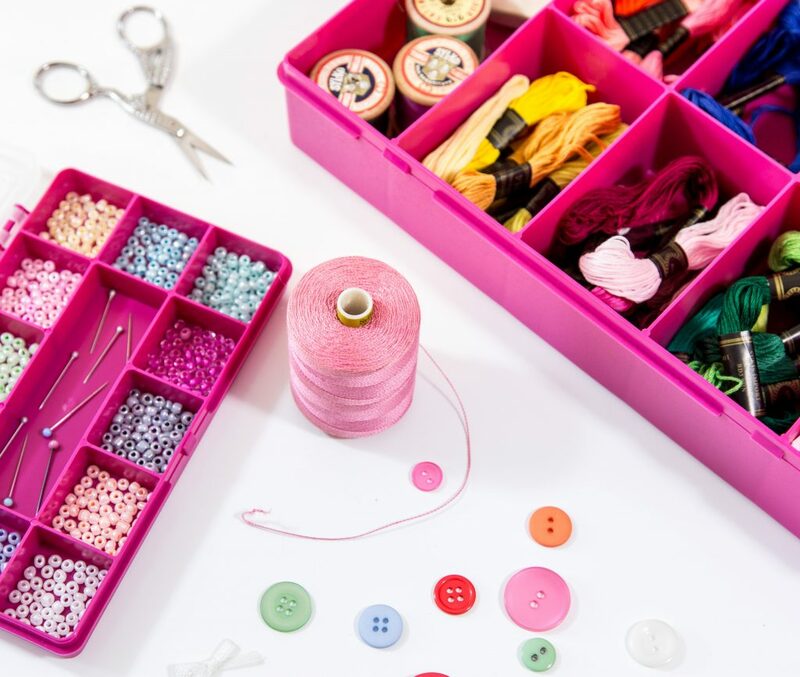 Our organiser boxes are great for storing all craft supplies in a neat and ordered way, meaning more time is spent creating and less is spent tidying up or trying to find things you have misplaced. 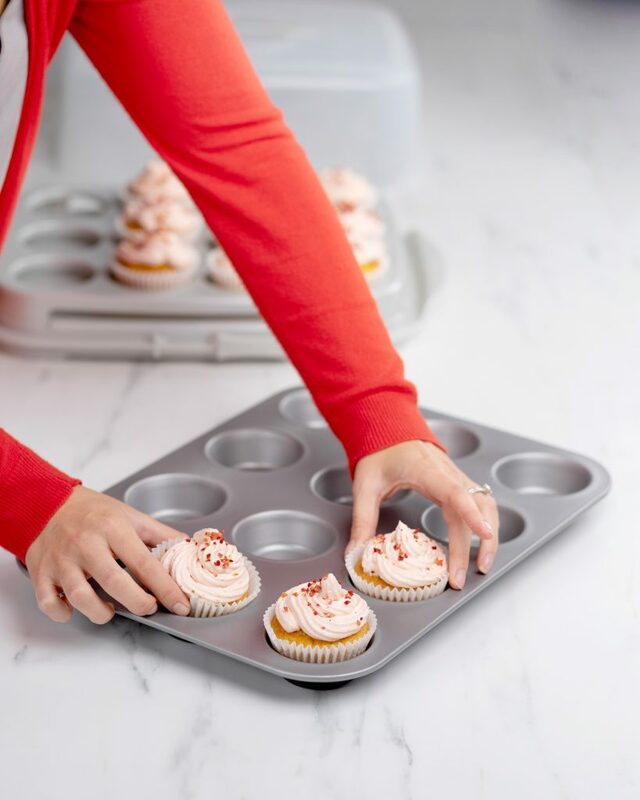 If you enjoy baking or cooking, we offer many ranges of bakeware, kitchen gadgets and utensils that can help you on your way. The responsibility we share to look after our planet has never been felt more. With the awareness brought by BBC’s The Blue Planet, we can all help to tackle the issue of single use plastic filling our oceans, and also makes for a New Year’s resolution that makes a difference to your wider self. To do so you can shop more wisely, chose food that doesn’t come with unnecessary amounts of packaging, recycle as much as you can, reduce or stop using single use plastic altogether, such as plastic bottles, bags, straws, q-tips etc. This doesn’t mean cutting out plastic altogether, reusable plastics are practical and will last far longer. 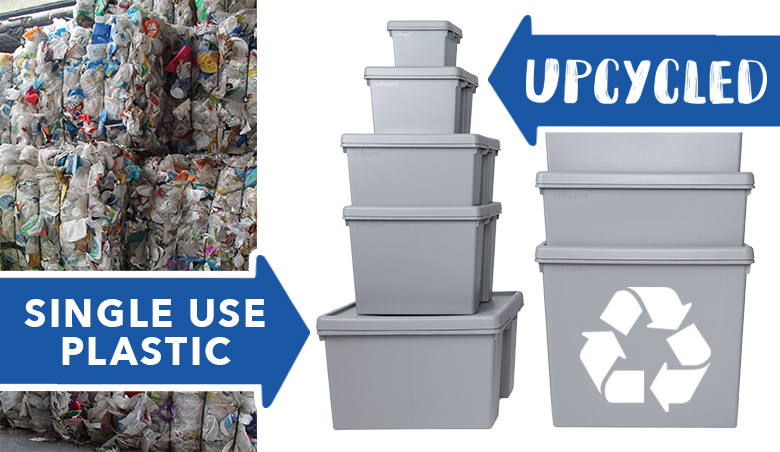 Our Wham® Recycled and Wham® Upcycled ranges are made from recycled single use and post-industrial plastic. Purchasing recycled plastic products such as these will prevent more plastic from entering our landfills and oceans. Made with quality in mind they are intended to be reused and therefore will last a long time. Once worn out they can then be recycled. Happy New Year and remember to fill your resolution list with achievable, feel-good goals to make you feel great and motivated to make 2019 the best year yet! 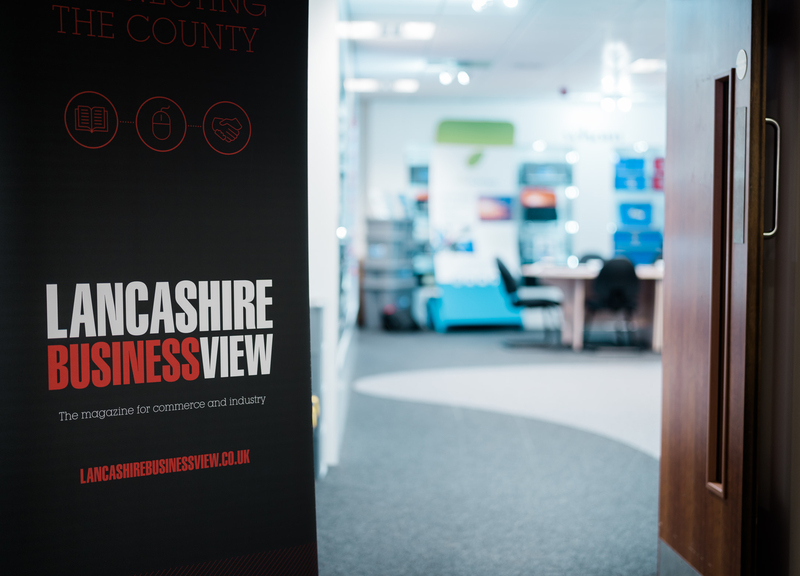 This October we hosted the Lancashire Business View Export Summit, a part of the Insight Series. 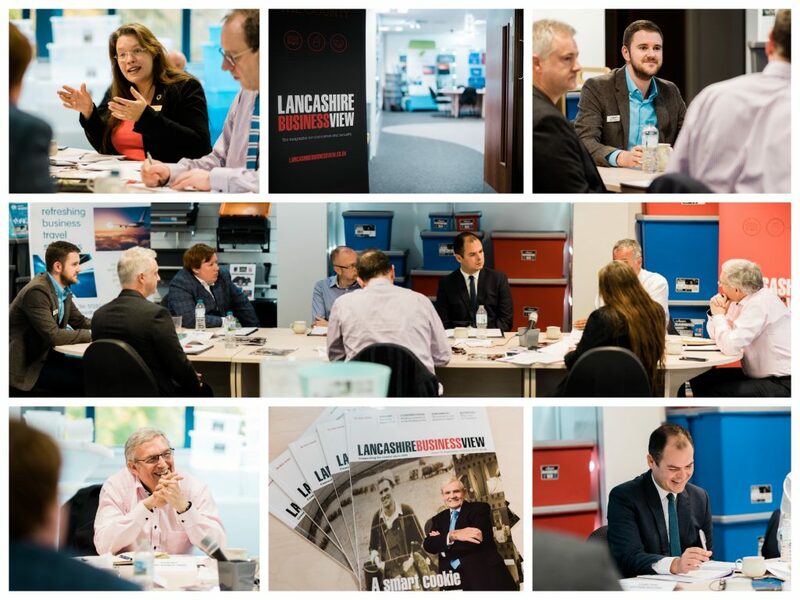 The meeting was attended by many businesses throughout Lancashire who are exporters to discuss the challenges and uncertainty of Brexit with export advisors. “As a British manufacturer it was a great pleasure to host the LBV Export Summit, especially at a time when exporting products is so important to the UK. We all found commonalities in the discussions and concerns raised regarding Brexit and it was especially helpful to receive different points of view on how best to tackle export in a post-Brexit market. The challenges we are face buying with materials from Europe, the risk of customers looking elsewhere and Chinese manufacturers copying equipment and products. The importance of flying the ‘Made in Britain’ flag and what it means to export customers. Dependable manufacturing and customer services that don’t let customers down. Especially recognised in USA, Australia, South Africa, UEA and the Middle East. How we adapt and evolve to benefit from new circumstances. Encouraging British companies who currently aren’t exporting. 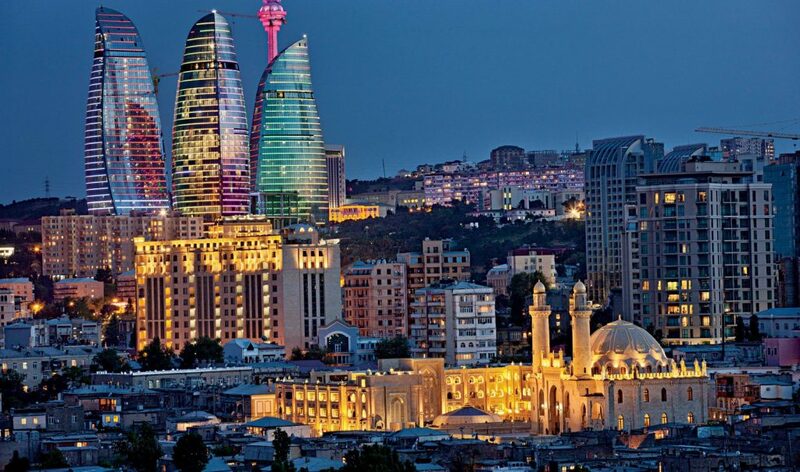 Putting plans in place to prepare for payments, exchange rate migration and cash flow. Take advise from the DIT and the Chamber of Commerce who’s advice is funded by the government and is easy to access. Regularly look at your terms and conditions. Food waste is damaging not only your wallet, but the environment. Energy, water and fuel is used in food production and is therefore wasted when the food isn’t consumed. Food that gets thrown away tends to end up in landfill, where it breaks down and produces methane, a greenhouse gas which is believed to affect the Earth’s climate. As a nation we throw away astonishing amounts of food. According to new figures from food waste charity Wrap, households in Britain throw away £15 billion of food every year. You’ll be glad to know that reducing your food waste can be incredibly easy. Here are five simple steps to waste less food and make your household more economical. Making these minor changes will not only help the environment but will also save you money. Planning your meals and knowing the exact amount of food you need each week will prevent you from buying too much from the supermarket. Also consider finding a shop that sells loose fruit and veg, to avoid buying unnecessarily big packs. It’s also worth educating yourself on portion sizes, do you or a family member tend to leave some food on their plate? If so, consider reducing the amount of ingredients to prevent this, or make slightly more and use the leftovers as a meal for the following day. The way in which you store your food will impact how long it lasts. 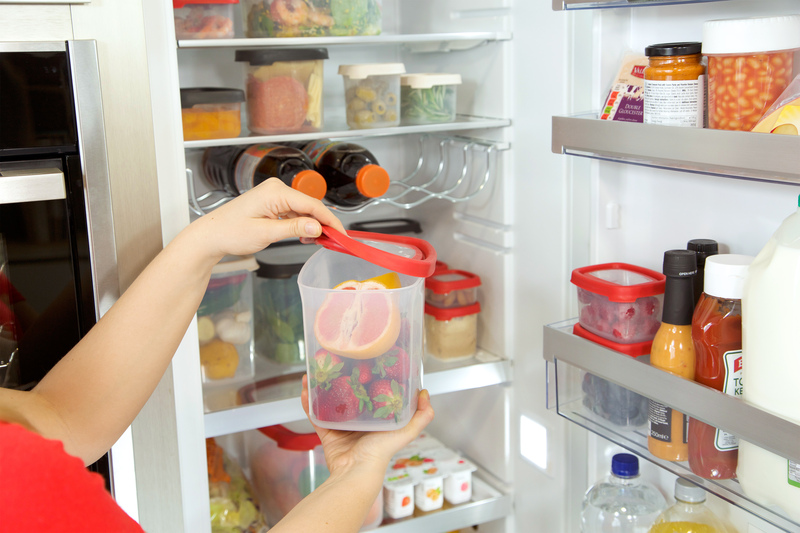 Storing food incorrectly could make it go off much sooner than necessary, causing preventable waste. 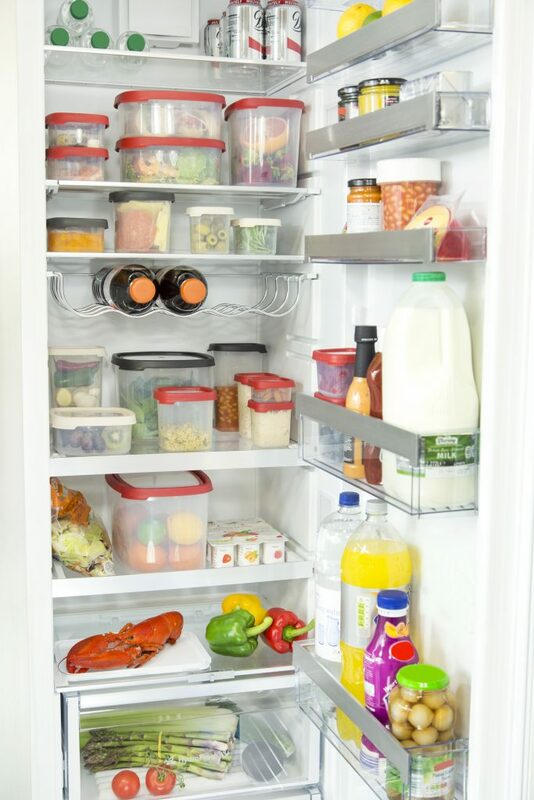 Your fridge has sections that are suited to specific food groups, using these properly will ensure your food remains safe to eat for as long as possible. 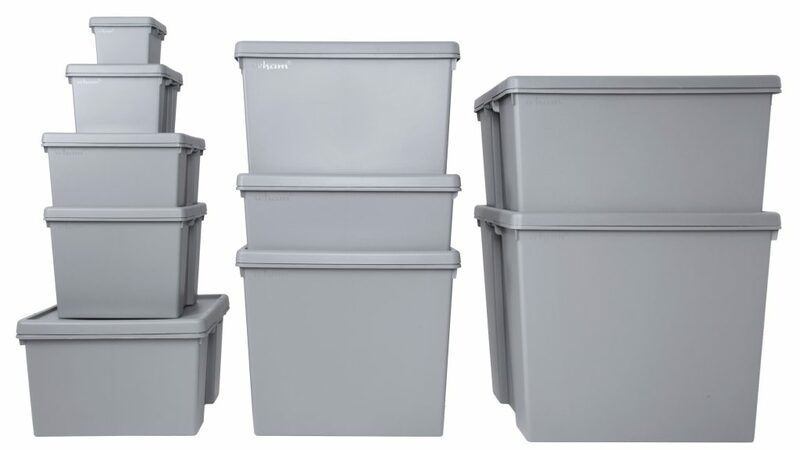 Airtight storage boxes should be used to store produce such as meat and leftovers. This is the most hygienic option and will stop food spoiling sooner than it should. Always try to fill the box as much as possible – the less air, the longer the food with keep, so its a good idea to have several sizes to hand. 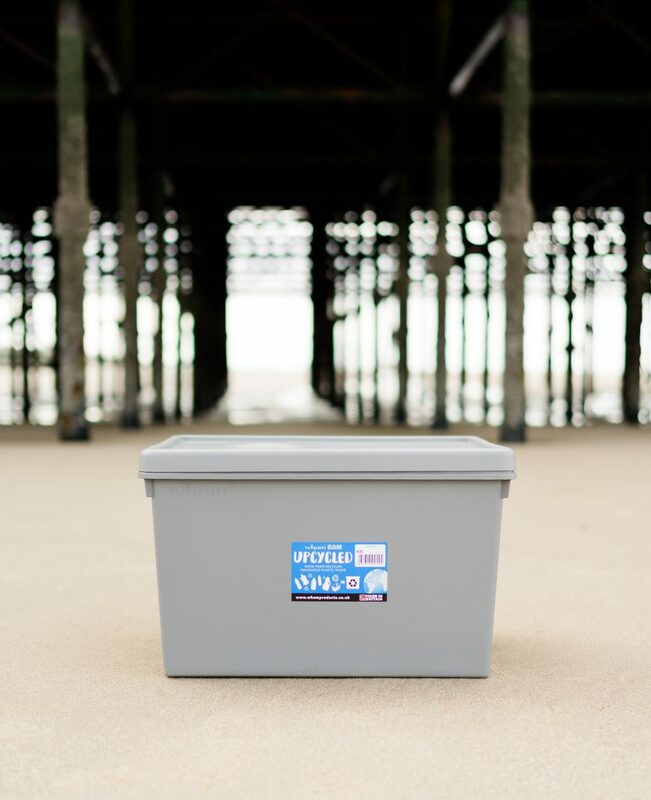 We like to use our Wham Seal It food boxes as they’re airtight with an easy open lid. They are also freezer, microwave and dishwasher safe, and with them being clear you can easily see the contents. Bear in mind square and rectangular boxes will make better use of the space in your fridge. The Seal It range has many size options that are stackable, so you’d be able to find the perfect sizes for your fridge. Use your weekends, or whenever you have some free time, to prep a batch of meals for the week. These can then be frozen and defrosted when needed. Our Seal It food boxes can be used in the freezer as well as the fridge; the seal will help prevent freezer burn. However, let the food cool before putting it in the freezer to avoid temperature changes. Get creative and try to make a meal out of any food left in your fridge. If you have some leftovers or food close to its use by date and are unsure how to use it before it goes off, consider making something simple yet tasty such as omelettes, frittatas, soup or sandwiches. If you’re struggling, the internet is full of inspiration! If you want to take organisation one step further you could label your boxes with their use by date, or colour coordinate using coloured lids as a system to know what will go off first or what type of food is inside (for example red lids for raw meat), the Seal It range has three coloured lids – red, cream and black. 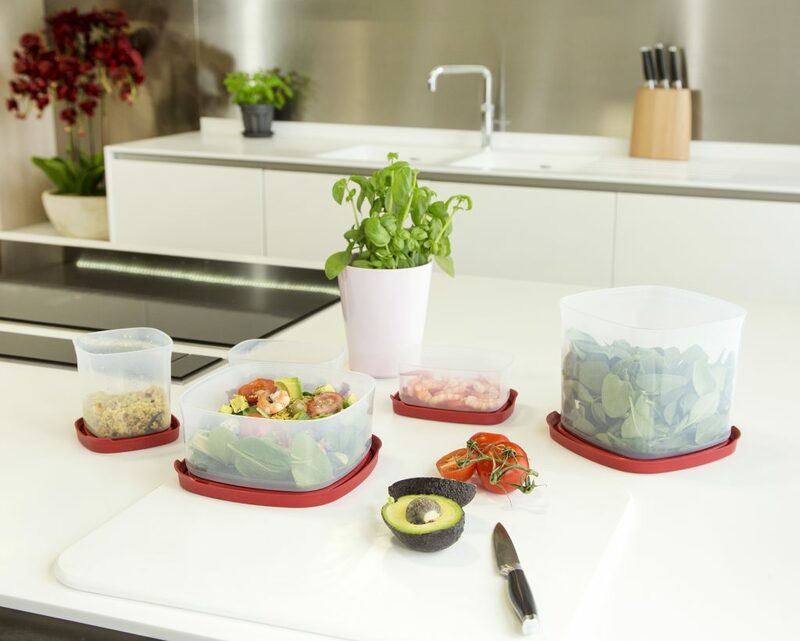 Or simply store your food in order – put food that will go off first to the front and new supplies or food with a longer life at the back, so that nothing gets forgotten about. When it comes to home storage, you shouldn’t have to compromise design and style for practicality. Our range of Wham Studio Baskets offer both. With a modern, glossy finish, these are baskets you could proudly have on display. Suitable for use all around the house, these useful baskets can be used for toiletries in the bathroom, clothes and accessories in the wardrobe or food supplies in the kitchen, there is a solution for every area of the home. We’re sharing some of our favourite ways to make the most of your space, keeping design and style at the forefront of our mind. We like to use size 1.01 for kitchen herbs – a great addition to your worktop and a hint at the very popular botanical interior trend. We’ve also made use of our biggest size, 5.02, to organise the cupboards. The best way to do this is to categorise each box, allocate one box for glasses, one for canned goods etc. This way you’ll save space and know where everything is. You could take it one step further by labelling your baskets, so that the contents are clear for anyone using the kitchen. 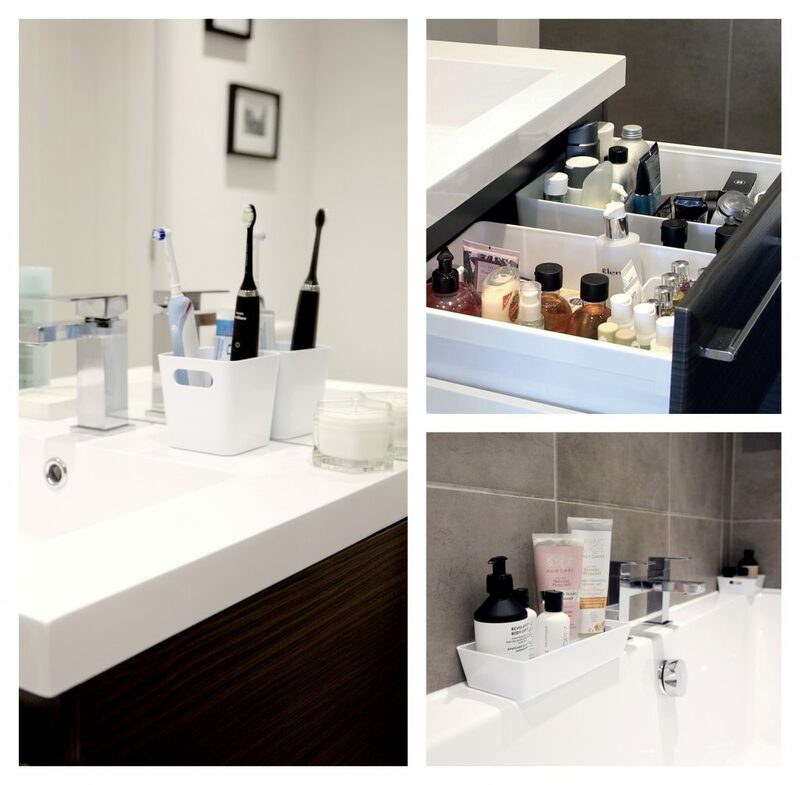 Plastic storage is ideal for the bathroom as it won’t get damaged by any dampness. Also, the glossy finish of our baskets compliments the shine of the bath and sink, creating a bright, modern and clean interior. We like to use the smaller sizes (2.01 or 3,01) to organise the bathtub with our favourite shampoo, conditioner and shower gel. Another favourite use for this room is the 1.01 for holding toothbrushes. For towels and larger toiletries, use the 5.02 in cupboards for a tidy and organised bathroom. Getting ready in a morning is enough of a chore as it is without having to search around for that pesky mascara or your favourite lipstick. 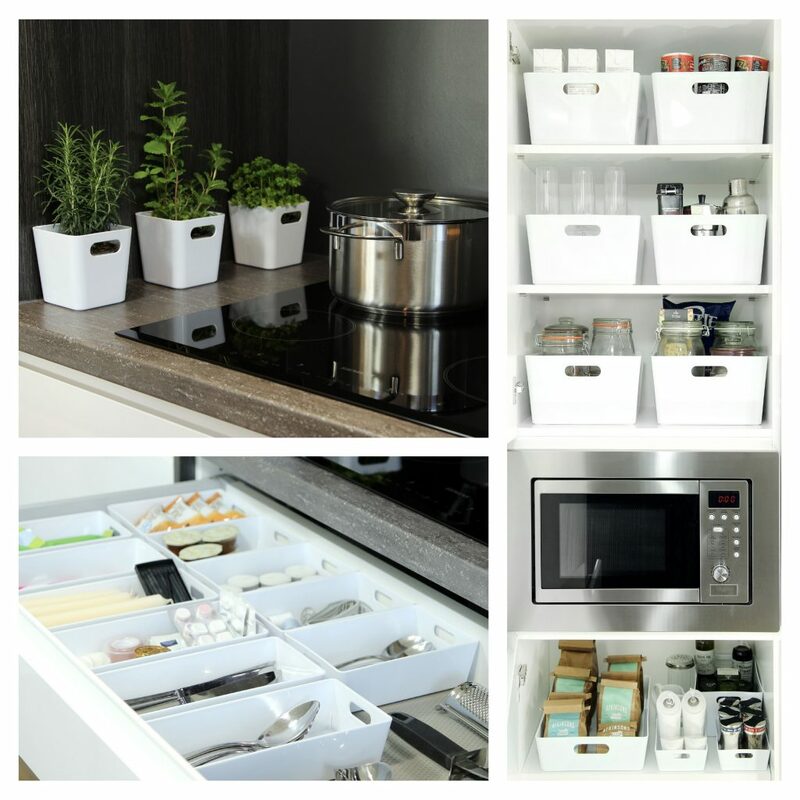 Keep everything organised with these tips. If your dressing table has a drawer then you can make use of the 2.01 and 3.01. These sizes slot into the drawers to make useful divisions. 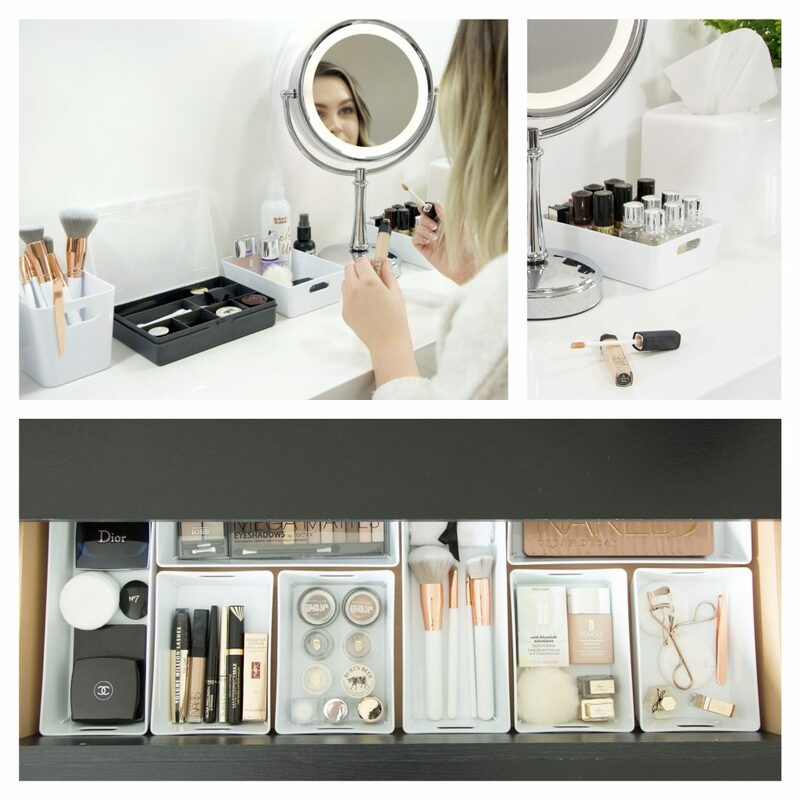 If you don’t have a drawer, keep everything you need to hand in a selection of basket sizes, for example the 1.01 perfectly stores makeup brushes upright and easy to reach. 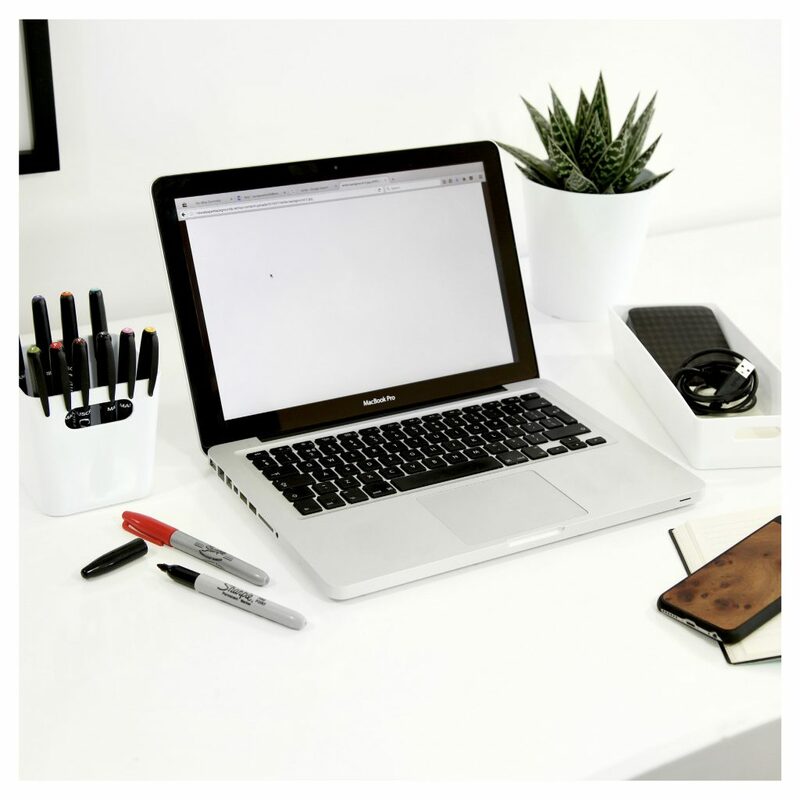 A tidy workspace can boost productivity as well as portray a professional image. Whether you have a home office, or you work at your place of business, these baskets can help you maintain an organised working environment. The 1.01 sized basket is great for storing all of your pens and pencils. For the rest of your stationery choose a few of the 2.01/3.01 sizes. 4.01 and 4.02 can be used to store envelopes and small notebooks, and for your A4 paper and files, the 5.01 is perfect, you could use multiple and categorise each one to make your job easier. We love how versatile the 5.01 is. Our favourable way to use it is as a centre piece on a coffee table. 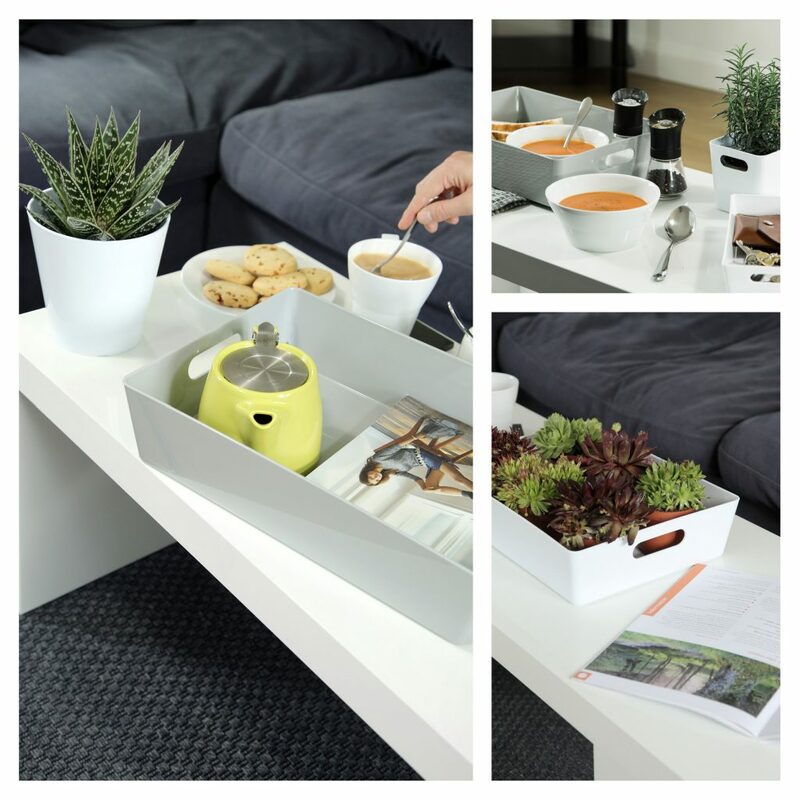 You can store your magazines, catalogues, books, candles, vases, flowers etc. Not technically storage, but we also love using the 5.01 basket as a tray; for carrying food or serving tea and coffee, and we even think it works great as a botanical focal feature – a planter for succulents and cacti, as seen here. It’s a good idea to have a designated place for items that often don’t have a ‘home’ and therefore usually end up going missing. Having one of the smaller/shallower basket options near the front door would be an ideal place to keep your keys – never again forget where you last put them! 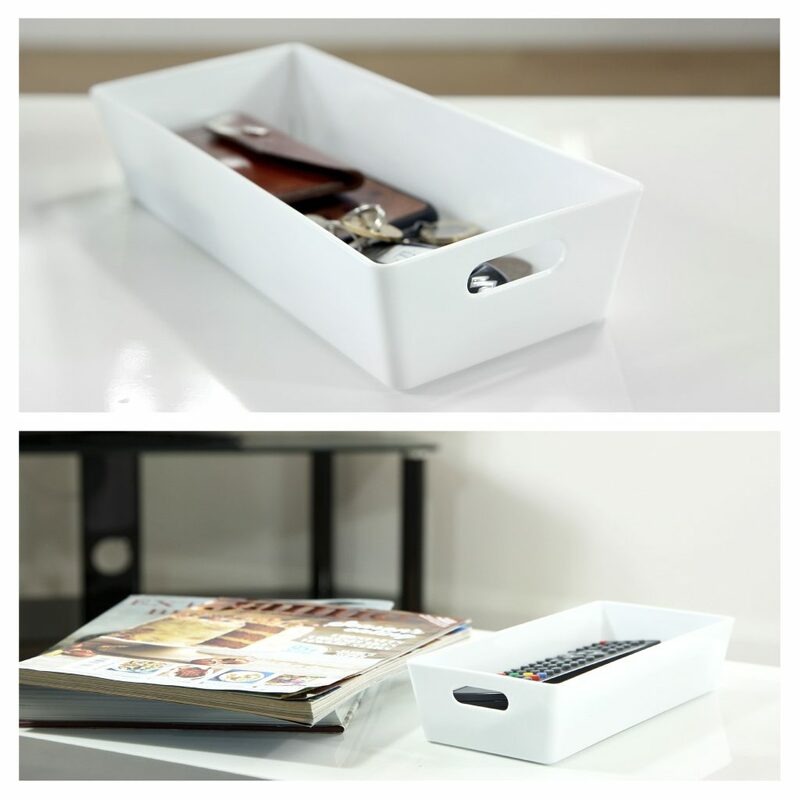 Also, they could be used in the living room, as a place to keep remotes, wallets or loose change. All set for TV and film appearances. What More could you want? Over the past month a great selection of What More UK’s products, from the Wham®, PushPan®, Baker & Salt and Flash brands have been chosen to appear on prime-time television and a new short film. In early August the production company Studio Lambert got in touch to request various products for The Circle, a new factual entertainment/reality series for Channel 4. To be broadcast 6 nights a week, over 3 weeks in a prime-time slot, The Circle starts on Tuesday 18th of September. The Circle is a bold new factual entertainment series that will ask provocative questions about modern identity, how we portray ourselves and how we communicate through social media. Individuals from all walks of life will compete in a popularity contest to win up to £50,000. They will all live in one modern block but separately in individual apartments, interacting with one another exclusively through a bespoke voice-activated social media platform called The Circle. We have provided a substantial number of products to help prop out the apartments including bakeware, tools & gadgets, cleaning products, storage and kitchen plastics. At the end of July a trade press article on www.housewareslive.net really grabbed the attention of our team. The production team of a new short film “Ethel” were looking for product donations from the housewares industry. The film stars BAFTA award winning actress Miriam Margolyes OBE in the lead role and explores the subject of an elderly lady living alone with Alzheimer’s disease. The aim is to help raise public awareness of people living with Alzheimer’s and dementia. Contacting the producer to discuss the film it was clear this was a project we could easily help with by donating products from across various ranges to help prop Ethel’s flat in the film. The film was shot in August and a wide selection of products across various ranges were donated for the project. Based on real events, Ethel is a film that looks to raise awareness of how elderly people can become vulnerable when living with dementia. It is always a great feeling when we sell our products in to a new market through our export sales team, who are always seeking out new opportunities. 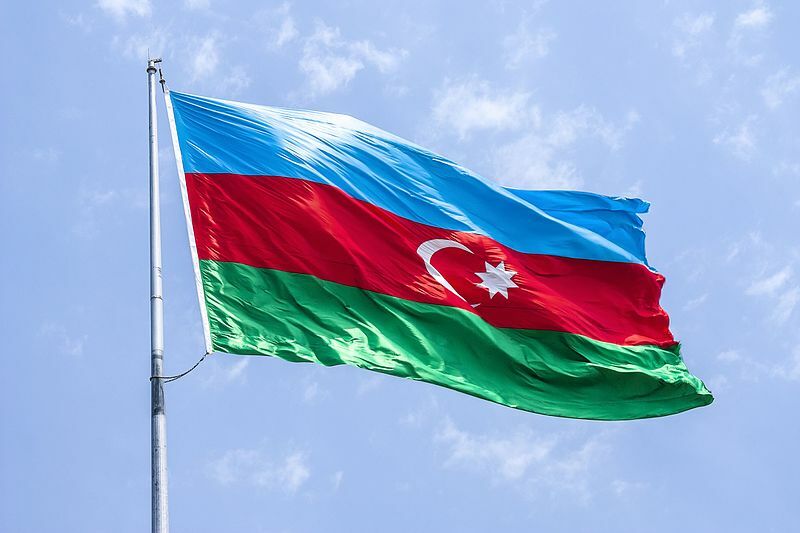 This week it is a new customer in Azerbaijan, taking our ever popular Wham Crystal storage range into another country. We are now proudly servicing 72 countries, all across the world. A trade press article really grabbed the attention of our team recently. The production team of a new short film “Ethel” were looking for product donations from the housewares industry. Contacting the producer to discuss the film it was soon clear this was a project What More could easily help with by donating products from across various ranges to help prop Ethel’s flat in the film, which commences shooting in mid August. 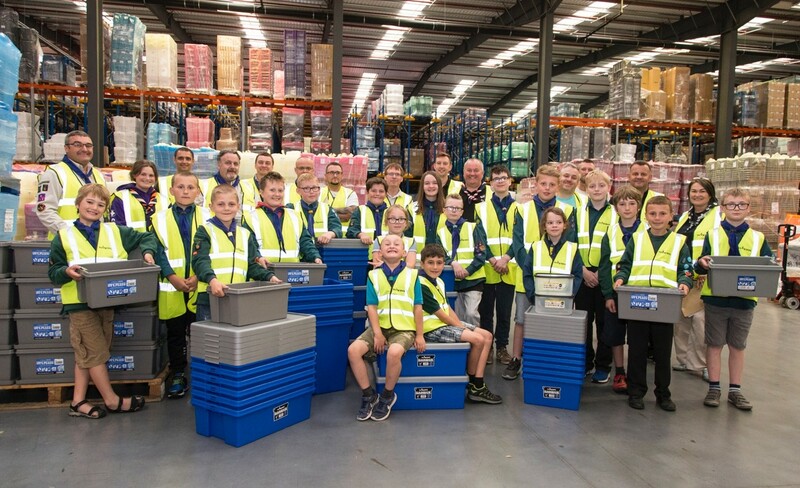 Hyndburn Scouts were excited to tour the What More UK factory, based in Altham, to find out more about the process of making the storage boxes and items they use every day. We opened our doors to the local Scouts for an exclusive factory tour and Q&A with our staff. 18 Scouts from the 1st Oswaldtwistle St. Pauls Scout group took part in the tour. Born and raised in Accrington, Stephen Lowe, BBC Radio Lancashire Presenter, joined the Scouts on their tour of the What More UK factory. With a passion for outdoor pursuits and getting involved with the local community, Stephen is a Scout Ambassador for East Lancashire and also Group Chairman of the 1st Oswaldtwistle St. Pauls Scout Group in his spare time. “We have had a brilliant night here at Wham, it’s been a privilege to show the youngsters what a fantastic manufacturing company this is right on our doorstep in Hyndburn. I want to say a huge thank you to Andy Holt for inviting us and also to all the members of staff that have been here tonight showing us around and answering the 3 million questions our scouts have put to them! I can’t believe it, it’s like having NASA here in our own town with the robots, machinery and products being shipped all over the world. It has been fantastic to see and an honour to have an inside view. After the tour we gave UPCYCLED boxes to the scouts to help with storage in their HQ, giving them a sturdy and long-lasting solution for organising all their kit. Every child also received a small UPCYCLED box, a lunch box and a re-useable folding water bottle to take home, encouraging them to ditch the single use plastics and opt for items that will stand the test of time! 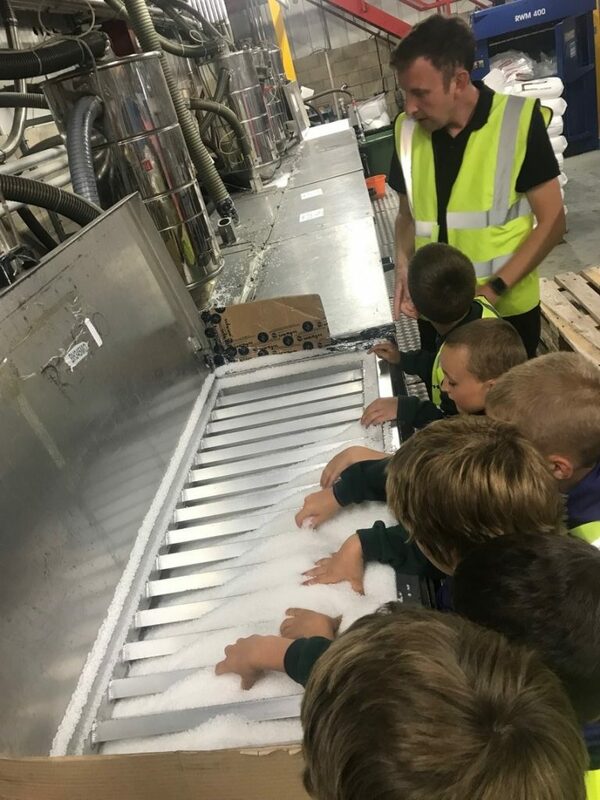 Matt Hand, Production Manager, explaining to the children which raw materials go into plastic products to. Baker & Salt vitreous enamelware is a finalist in prestigious industry awards! This week saw the finalists of the prestigious Excellence in Housewares Awards 2018 being announced. Naturally we were delighted to find out that our popular Baker & Salt vitreous enamelware range has been chosen as a finalist amongst leading household names in the Excellence in Cookware category. 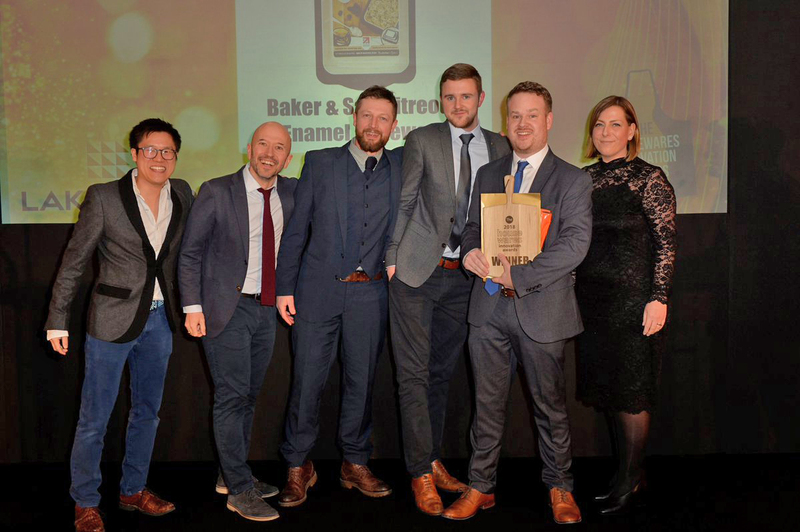 Organised by trade magazine ‘Progressive Housewares’ in conjunction with the Cookshop & Housewares (CHA) division of trade body bira (British Independent Retailers Association), the awards recognise and reward the achievements of UK housewares products (and retailers) over the past year. Hundreds of housewares products launched over the past 12 months were judged by a panel of more than 25 housewares buyers last week, including representatives from John Lewis, Steamer Trading Cookshop, Lakeland, Blue Diamond Garden Centres, Borough Kitchen, Debenhams, Tesco, Essentials, Fenwick, Harrods, Harts of Stur, Home Hardware, Kitchen Range, Kooks Unlimited, Leekes, Lords At Home, Potters Cookshop, Prep Cookshop, Richard Dare and Trevor Mottram. The winners will be revealed at an awards ceremony in London on October 3 – fingers crossed! What More UK made a visit to Peel Park primary school on Monday 2nd of July to answer questions about our plastic products and explain the role the children have in the future of the planet. 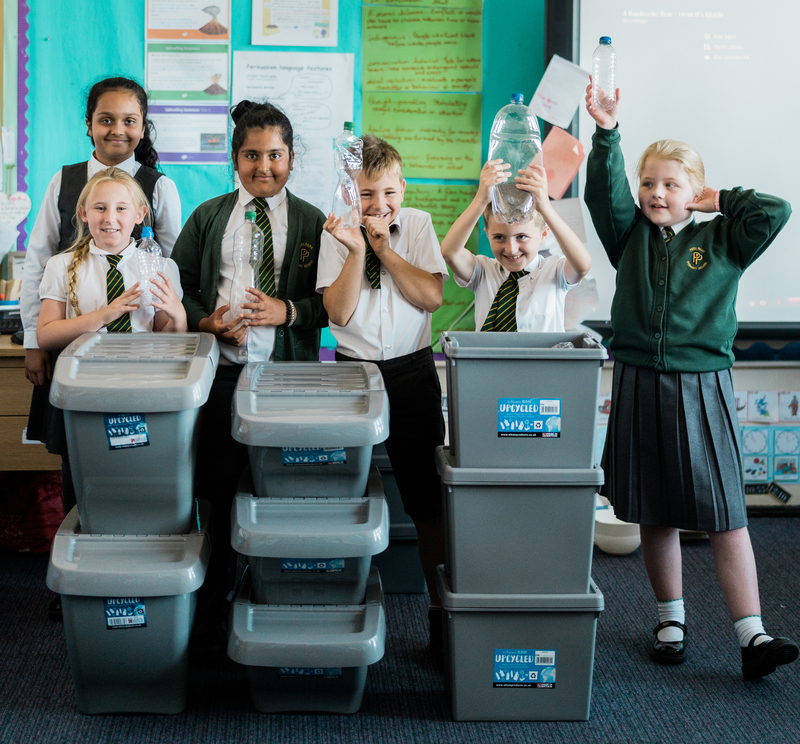 Peel Park Primary School pupils have been learning about plastic waste in the environment, how it affects habitats and their own responsibilities to look after the earth, Claire Hilton, year 4 teacher, invited What More into the classroom for a morning of fun and facts about plastic. The children were shown three different types of plastic boxes that were all made from plastic that already exists! The first was a Wham® UPCYCLED box which is made from items like plastic bottles, yoghurt pots and pot noodles. The second: a Wham® Recycled box made from factory waste like plastic offcuts. The third – the one they found the most exciting – made from waste product when producing banknotes, the Wham® Banknote Box! For years we’ve all known about the ocean plastic problem. Ten years ago, whilst snorkelling in the seas of a Blue Flag beach in Majorca, I saw the how the tide brought in rubbish caught in heaps of seaweed each day. 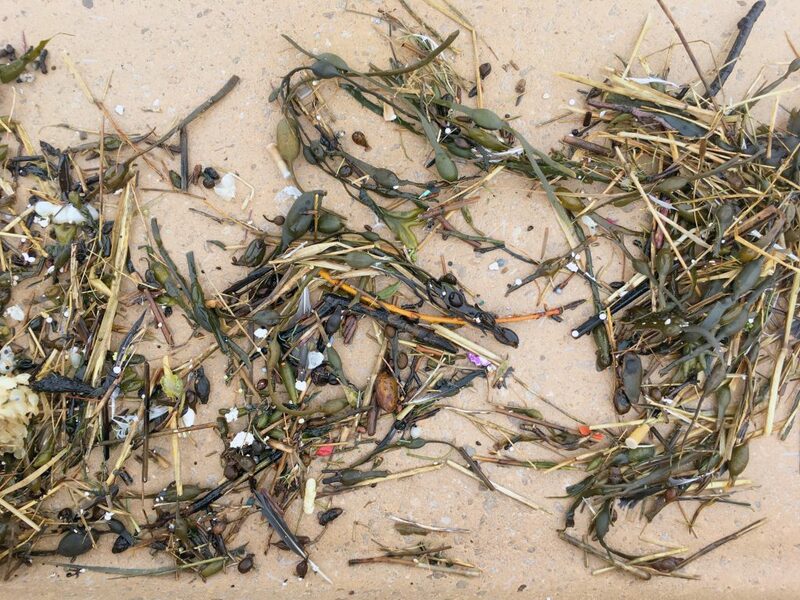 An earlier storm caused the seaweed to come ashore, bringing with it plastic that had been floating on the sea surface. When snorkelling, we usually look out for translucent jellyfish, dodging a nasty sting, instead we kept swimming into translucent plastic film. The suns UV rays had bleached the plastic, leaving a see-through vail that was easy to swim into. I was shocked at how bad the situation had gotten, especially when the beach was Blue Flag certified. Unfortunately, it has taken decades for it to become widely acknowledged. A general lack of respect and self-awareness for littering is evident in our country and the world as a whole. 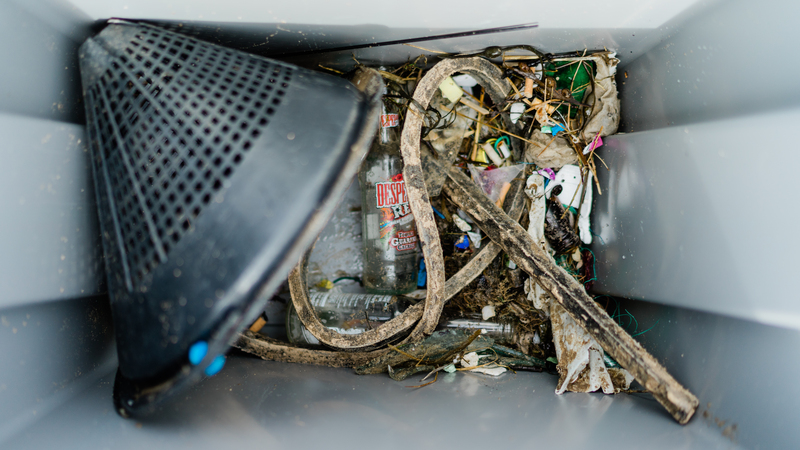 Most road sides are littered with rubbish, which blows into our seas, pours into our street drains, and gets flushed down our toilets, ultimately polluting our water ways and affecting wild life and the health of our environment. 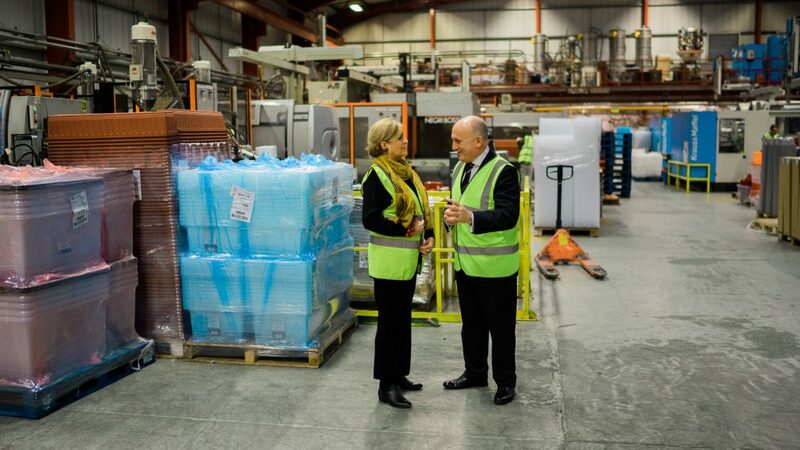 Over a year ago, What More UK embarked on the pledge to use recycled plastic waste in our products, since then we’ve embarked on learning about the full process. Visiting recycling plants based in the UK, we learnt how complicated the process is made because of packaging being made from so many types of plastics and other materials. To find out first-hand what plastics are going into our oceans we headed to the fun fair town of Blackpool to take part in a monthly beach clean organised by Sea Life Centre in conjunction with LOVEmyBEACH and Keep Britain Tidy. On a clear Saturday morning 25 What More staff, friends and family met up with 20 volunteers from the general public and headed out with pickers, bags and our Upcycled boxes, dressed in high vis vests ready to clean Blackpool’s huge beach. After a safety briefing by Emma Whitlock (LOVEmyBEACH Coordinator), we realised how many hazardous items that we could encounter. 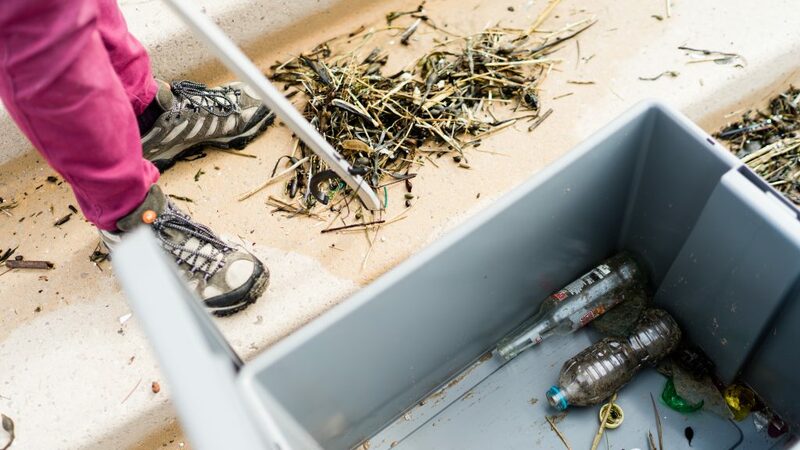 The Upcycled boxes were brought along to help with the clean, and quickly became very useful for holding broken glass, metal and any other sharp and bulky items of rubbish. On the outset it became evident that Blackpool’s beach is largely clean and healthy. Most of the waste found had been washed up nearer to the promenade. Here you could see how far spread the smaller pieces of plastic could reach. Some of which we needed a brush to pick up, not a picker. We spent a long time picking up cigarette butts on the promenade. The core of most cigarette filters looks like white cotton but is actually a form of plastic called cellulose acetate that is very slow to degrade in our environment. The spread of Polystyrene was probably the most evident. As a company and on a personal level, the morning really highlighted how the problem has become a part of our everyday lives. We all reported that we noticed litter more prevalently in our local areas once we returned home. Most of which is by the road side waiting for the council to pick up before the wind blows it out of reach into our water ways. It was a worthwhile morning to meet Emma and to learn about the great work being done by volunteers all over the country. We hope to work alongside Keep Britain Tidy and LOVEmyBEACH in the future to see how we can be of further assistance. 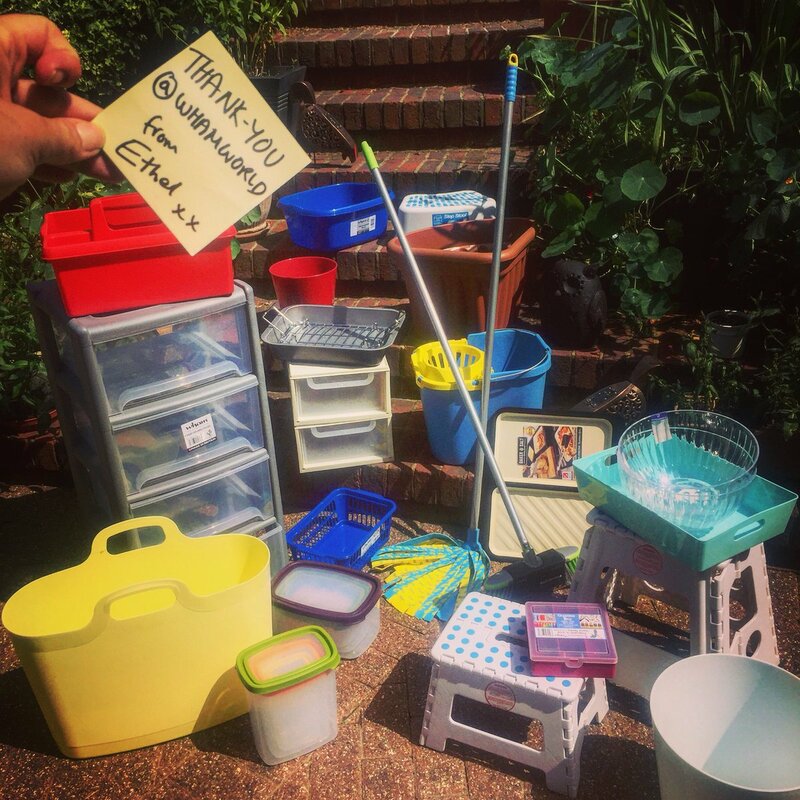 It was great to be able to give the Upcycled boxes to Emma to help with future beach cleans. To see the product come full circle by carrying some of the plastic used to produce the Upcycled range was a rewarding exercise and we aim to bring awareness to the problems caused by single use plastic waste. Responsible recycling can help slow and even eradicate a rapid environmental crisis, but more has to be done to eradicate some single-use plastic like straws, cue tips, plastic film food packaging. As a plastic manufacturer we know how useful in our daily lives it can be. Plastic helps with hygiene and is especially useful in the kitchen, from your bin, sink bowl and reusable food boxes. Its durability can also help with general storage keeping your house tidy. These types of plastic products can last for years in your house, and when worn can be easily recycled and made into other useful plastic products. The correct message about how we use plastic and what plastic products we should use is not widely shared. As a British manufacturer we want to recycle the single use plastics that we have to use day to day, and make products that can help with your food shop (fish and meat put in your reusable boxes) – food boxes and help sort your recycling – Recycle bins. 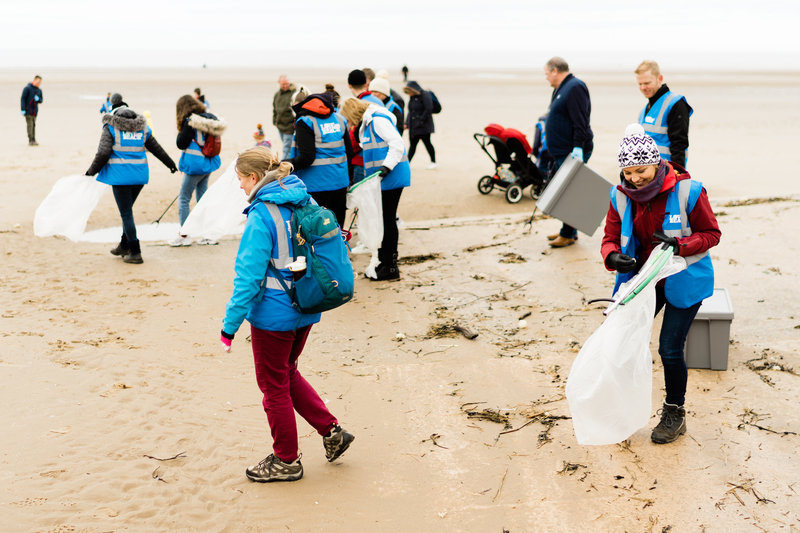 If you would like to take part in a beach clean or litter picking project visit: Keep Britain Tidy Sea Life Beach Clean and how you can help. The key is to educate, and we endeavour to bring awareness as our company evolves and produces more recycled long-life plastic products. The WHAM group of companies, headed up by Andy Holt, has donated £10,000 to Accrington Stanley Community Trust. The Trust is a self-funded, non-profit, registered charity that has been working closely with the Hyndburn community since its establishment in 2007. With their initial intention to bring the professional football club and the community closer together, the trust has now expanded to work in four key themed areas: Sports Participation, Education, Health and Wellbeing, and Social Inclusion. 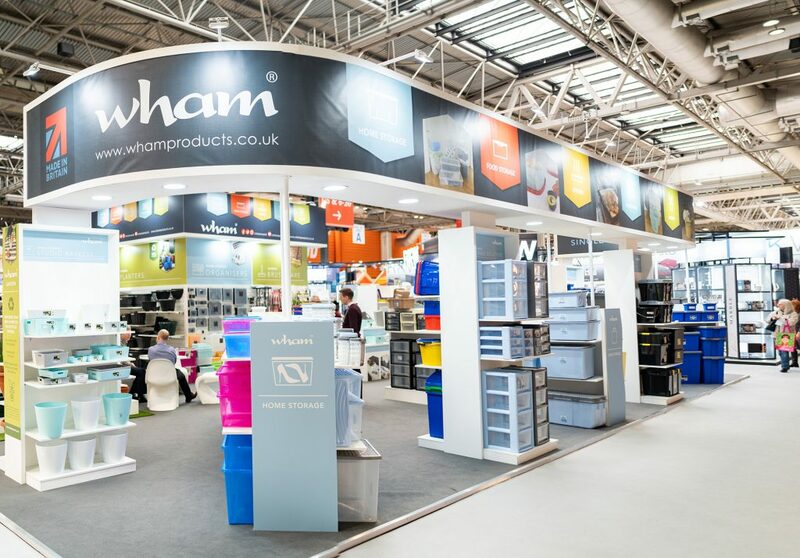 What More UK are the UK’s largest manufacturer of plastic household accessories and storage boxes under their brand names Wham, PushPan and Wham Cook. What More UK’s quality products are recognized globally and currently distributed to 71 countries. Keen to give back to the local community, they chose to donate £10,000 to Accrington Stanley Community Trust. Their vision: to use the power of Accrington Stanley Football Club to improve the lives of the people of Hyndburn through participation in sport and exercise. Determined to find a viable solution, with no long-term consequences, to the January 2018 Chinese importation ban on plastic, we have created our UPCYCLED range. Previously, the UK has not dealt with post-consumer waste plastic within its own shores and has relied on this exportation to countries such as China. The recent ban meant that this plastic would either be burned or buried – neither an ideal solution. Working directly with recycling centres, we spent countless hours and days testing and trialling a process which is now commercially viable, they have manufactured a product range made from 95% post-consumer waste plastic – UPCYCLED. Pollution and plastic use is a hot topic, with many influential figures such as MPs taking a stand, choosing to not use single-use plastics (PP plastics) in their day to day lives. PP plastic was traditionally notoriously difficult to sort for recycling, but new sorting technology has made this easier, allowing use post-consumer waste to make a commercially viable range of UPCYCLED products. The issue still presents, however, with what will come of all the current PP plastic in circulation and lack of a viable alternative? Plastics offer a hygienic, disposable, storage solution for items such as liquids, foods and first-aid equipment. 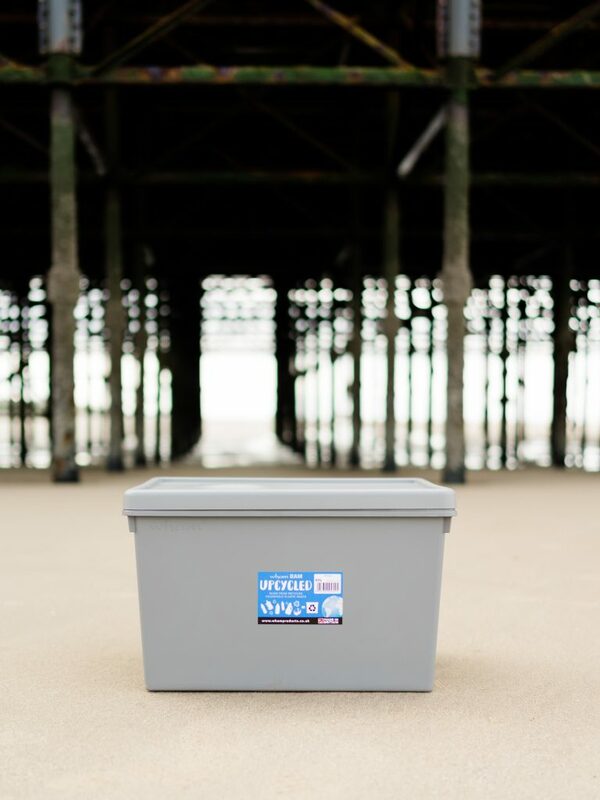 We have created the UPCYCLED range – strong, durable, lasting storage boxes made from plastic that would have been previously shipped away. We have all been aware that plastic waste has become an overwhelming pollutant of our land and oceans. Programmes such as BBC Blue Planet II brought profound awareness to this global problem. As a plastic manufacturer you would be right to ask what part in this story do we play? You may ask, to what extent does a plastic manufacture care about the environment, when companies like What More UK are adding to the problem? It’s true that we make plastic products, what’s misunderstood is what type of products we make and what plastic we use. 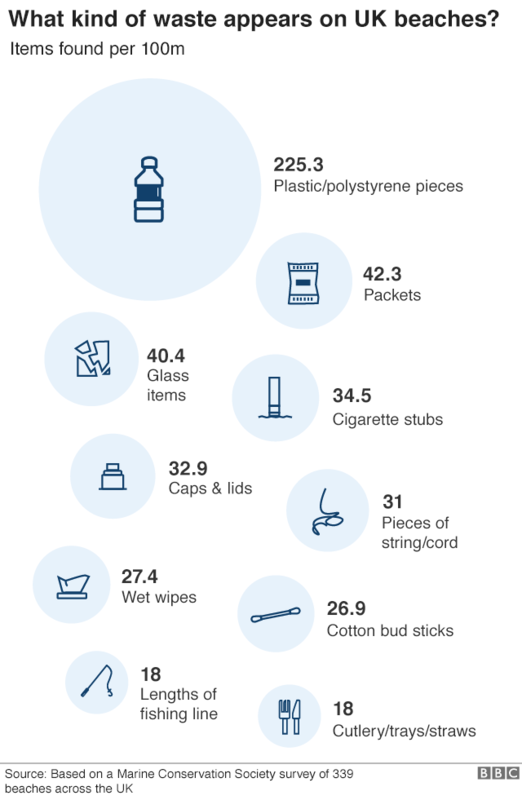 The vast majority of the ocean waste is made up of single use plastic; like plastic bottles, bags, straws and fishing tackle. What More UK do not make single use products, we produce RE-USEABLE plastic products for the home and businesses, one of which is a range of recycling bins. Our products are built with quality in mind to last far longer than your average plastic bag for life or plastic water bottle. Rather than adding to the problem, What More wants to help create a solution. As the oceans fill with plastic What More is pledging to help create ways of reusing your household plastic waste, especially the type found in our oceans. Not only is there a pollution problem, but we also have challenges of how to process the plastic we are already putting in our recycling bins. Last year China announced that it no longer wanted to be the “world’s garbage dump” and banned the import of our recycled waste. If you weren’t already aware, two thirds of our recycled waste were shipped off to as far as Hong Kong to be processed. The sudden ban has left Western countries at a loss as to how to deal with the build-up of plastic and paper waste. As a plastic manufacturer we have pledged to help the current plastic crisis by making durable, re-usable plastic products from industrial and household single use plastic waste. 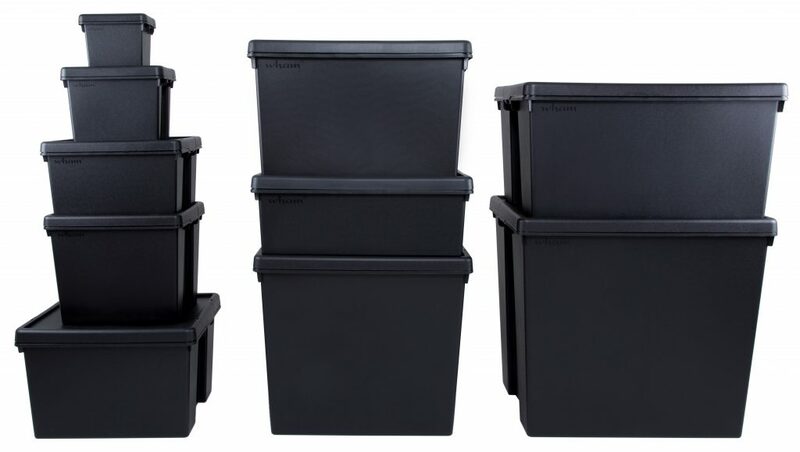 Currently… As a manufacturer of reusable plastic products, we already recycle our own plastic waste by re-grinding and remoulding it into our black products, one in particular is our Eden dustbins. Our products are also made from recyclable polypropylene which is widely recycled. Therefore, if our product is damaged from normal wear and tear you can easily recycle it. Looking to the future… In the past year we have been working towards making products from recycled plastic. For our annual exhibition, Spring Fair we launched two ranges that tackle the current plastic waste crisis head on. All products labelled as UPCYCLED are made from reground recycled SINGLE USE household plastic. We are currently developing new product ranges that will be made from this recycled material. This in turn will prevent more plastic going into our oceans. We hope to use this new material increasingly in our vast product ranges. This range will predominantly be black, made from industrial waste plastic like car bumpers and crates. The material has currently gone into our Wham® Bam range. 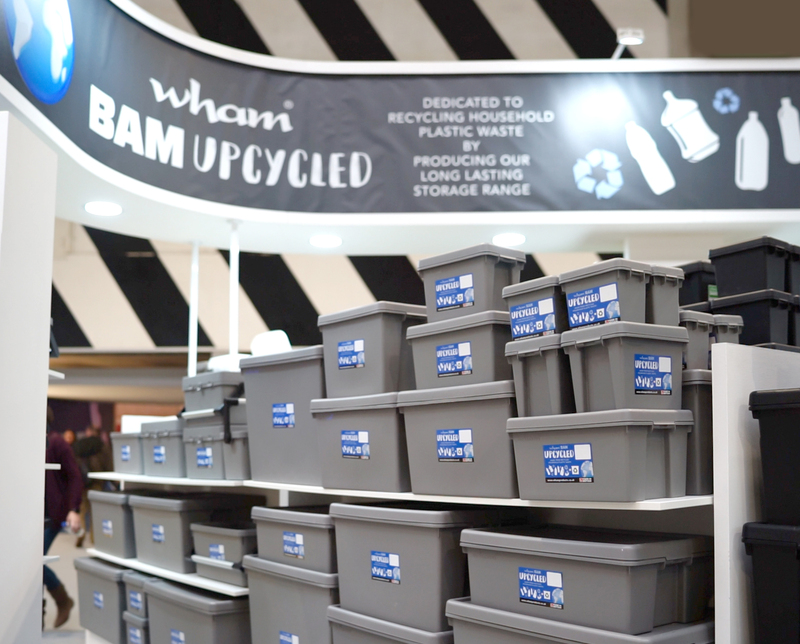 Although recycled plastic isn’t as strong as first grade polypropylene, it still holds on to Wham® Bam’s strong properties making it a robust recycled storage range. A range perfect for tradespeople, garages and warehouse storage. 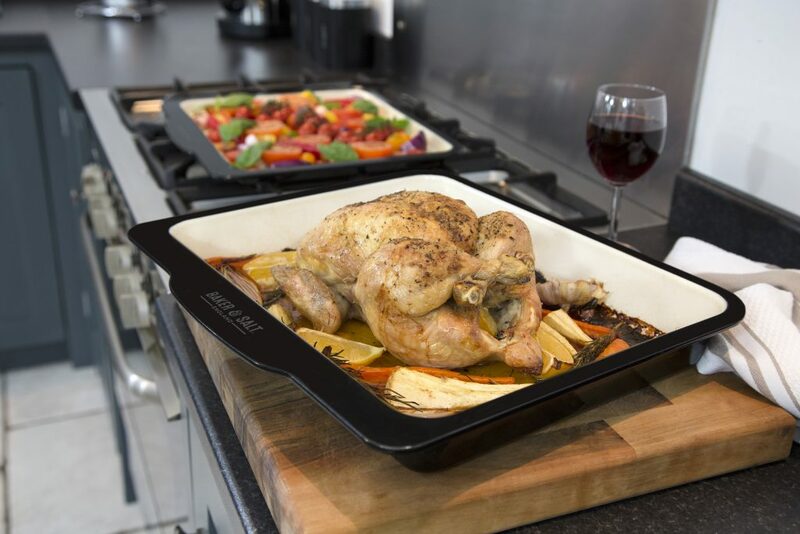 What More UK took home a highly coveted Housewares Innovation Award at this year’s ceremony, clinching the top spot in the Bakeware Innovation category with the Baker & Salt vitreous enamel collection. 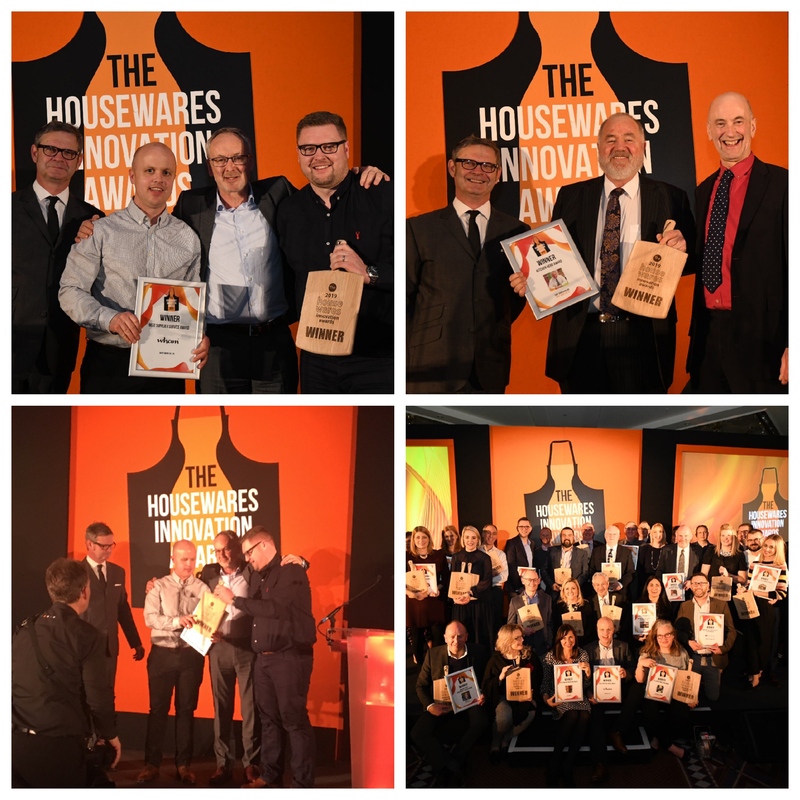 Last night the very best from across the housewares sector gathered to celebrate the successes of the past twelve months at the Housewares Innovation Awards, held at Birmingham’s National Motorcycle Museum. 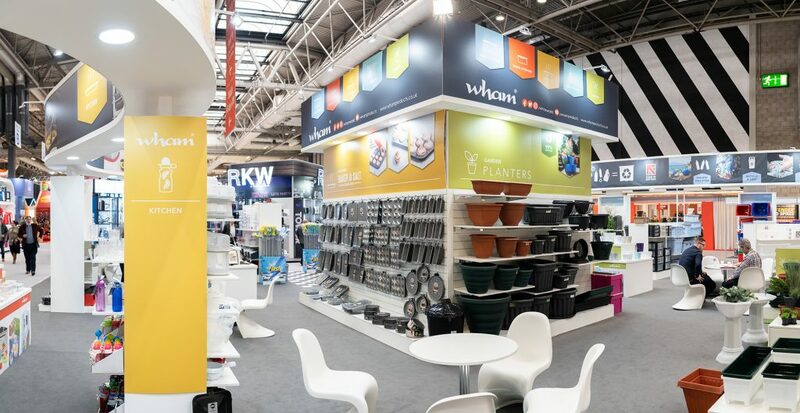 Organised by Housewares Magazine and its digital partner Housewareslive.net, in partnership with Spring Fair, the Awards recognise and reward the outstanding products, retailers and suppliers that make the sector so great. On arrival guests were treated to an exclusive drinks reception, providing an opportunity to catch up with old industry friends, colleagues and potential clients ahead of the awards ceremony. The evening was hosted by actor, presenter, writer and producer Ryan Philpott, who was joined by industry favourites – The Wine Show’s Joe Fattorini and School of Wok founder Jeremy Pang. The full list of this year’s winners and highly commended are available online at www.housewaresinnovationawards.co.uk. While celebrating the successes of the industry, the Housewares Innovation Awards also took time to honour the vital work of The Rainy Day Trust. For 175 years, the charity has been providing financial assistance to individuals from the home improvement and enhancement sectors. A charity collection took place throughout the evening, the total of which will be revealed on the Housewares Innovation Awards website shortly. The Housewares Innovation Awards were sponsored by Aspin, the British Home Enhancement Trade Association (BHETA), Brookes & Co, Creative Products, Creative Tops, David Mason Design, Dexam International, DKB Household, Dutch Creative Brands, The English Tableware Company, Gourmet Gadgetry, Harts of Stur, Home Hardware, Horwood, The International Housewares Association (IHA), Joseph Joseph, KitchenAid, KitchenCraft, Lakeland, Magimix, MJ Harradine Ltd, Potters Cookshop, PR Direct, School of Wok, Stax Trade Centres, SMART Worldwide Ltd, T&G, What More UK Ltd, Villeroy & Boch and The Rainy Day Trust. 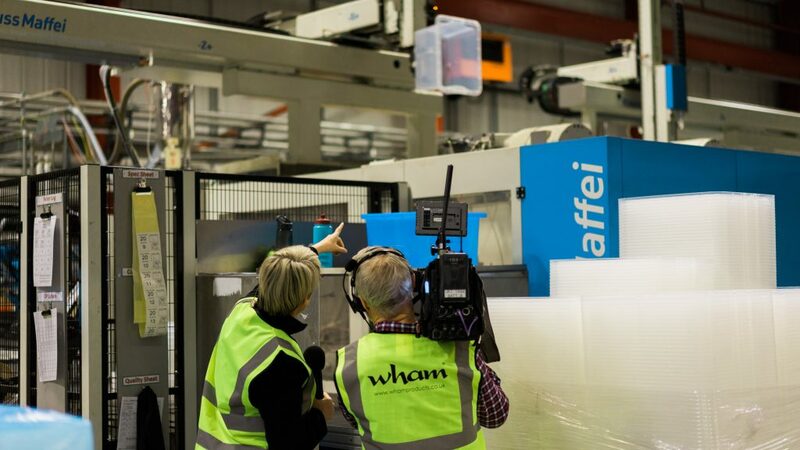 Monday 8th of January 2018 saw a BBC crew arrive very early on site at our Altham factory to film for a news feature looking at how British manufacturing is on the up and in particular exported goods. 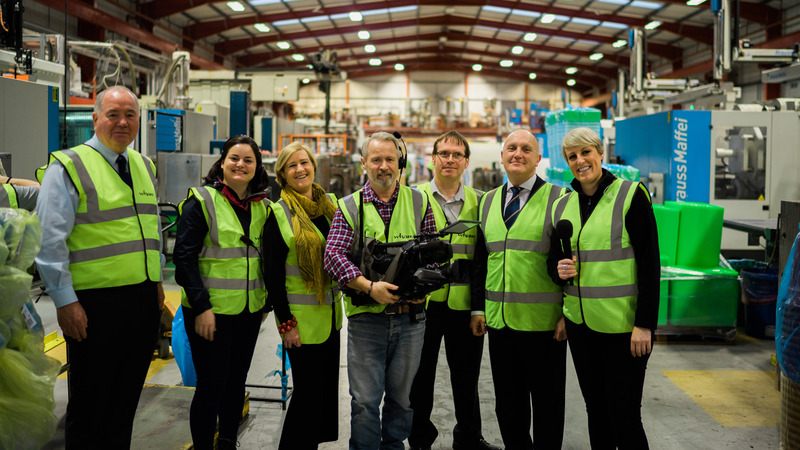 BBC Breakfast Business Presenter Steph McGovern was on site as our busy factory was in full production of numerous products destined for the domestic and international markets. Director Tony Grimshaw OBE was interviewed several times throughout the morning broadcast to explain how the company has steadily grown its export market to now service 71 countries globally. In addition leading experts in both export and manufacturing were interviewed on site. 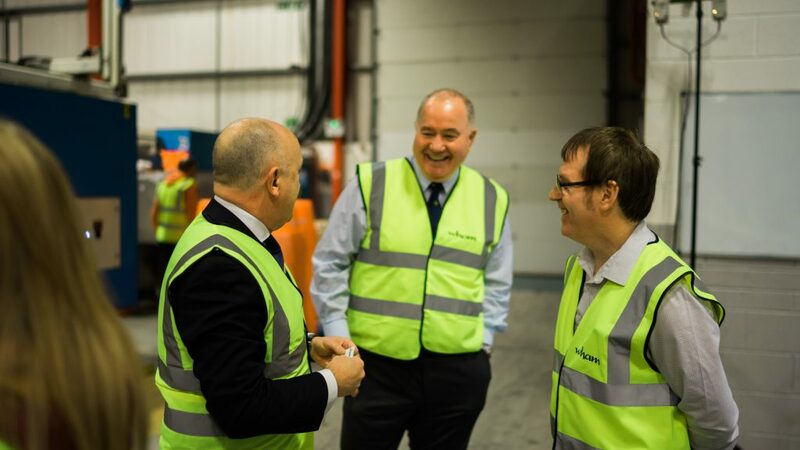 Lesley Bachelor OBE, Director General of the Institute of Export and Stephen Phipson CBE, Chief Executive of EEF (manufacturers’ association) were the experts being interviewed.